On sunny days, I am very easily distracted from my work. At the moment with my important essays going on, I have to keep going despite the sunshine. To console myself, I made brownies. 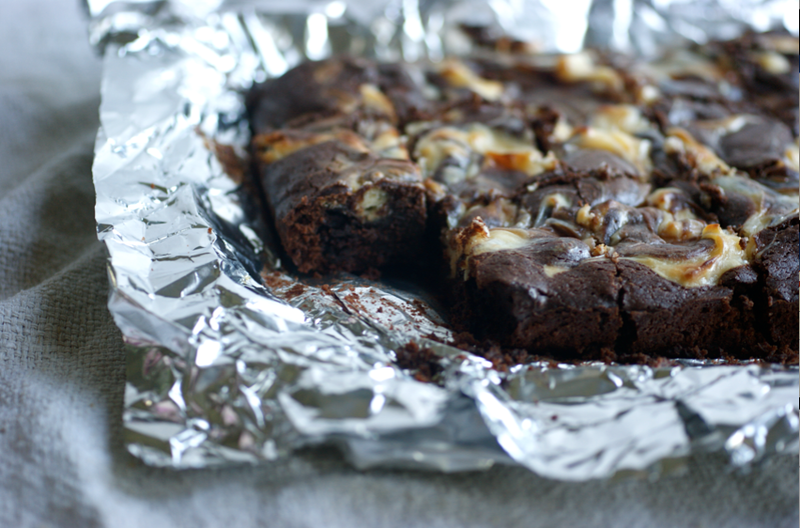 Not just normal brownies - but cheesecake brownies. Today, when I found my mind wandering to the long rectangles of sunlight warming the carpet in front of me, I decided to put the sunshine to good use. 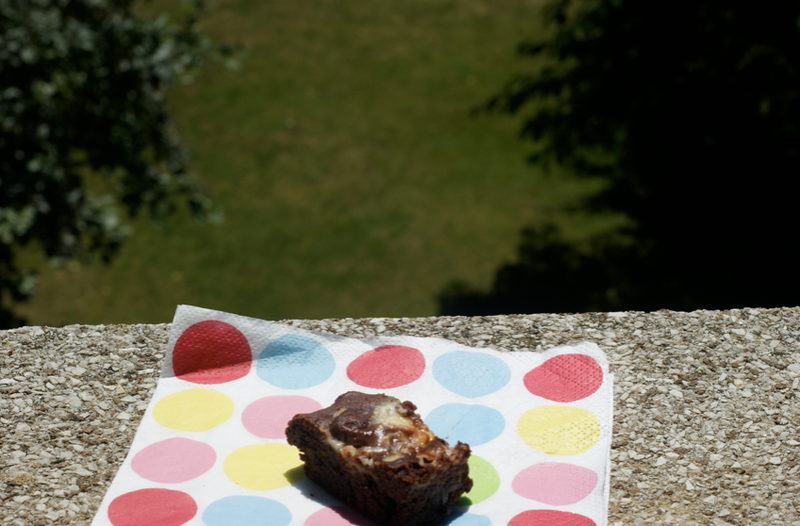 So I warmed my brownie on the sun-soaked windowsill, then curled up on the sofa again with my book. This is not baking for the fainthearted. There's lots of chocolate and butter, then plenty of sugar and eggs, then more chocolate in the form of cocoa powder with flour, then chunks of chocolate, then lots of cream cheese mixed with more sugar and eggs and... it's quite a marathon. 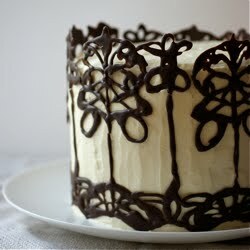 I think it's important to use dark chocolate for these, at least 70%, otherwise they would be too sweet. Preheat the oven to 180C/350F. Line a tin (I used 11" x 7", you could also use a 9" square pan) with foil, creating a lip over the sides. Grease lightly. Melt the butter and chocolate over a low heat in a saucepan. Stir until smooth, then take off the heat and beat in the sugar and then the eggs. Beat in the flour, cocoa and salt, followed by the vanilla and chopped chocolate. Spoon into the tin and spread out evenly. 200g cream cheese, at r.t. 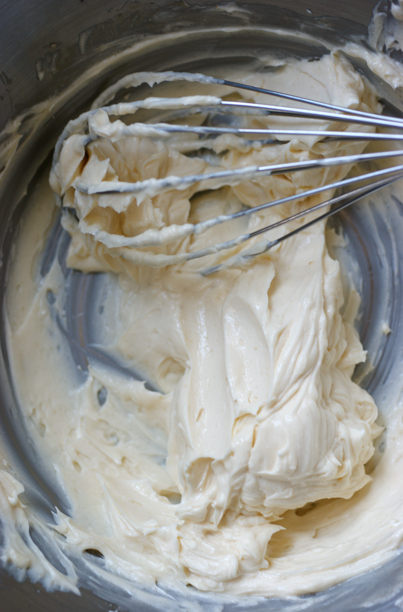 Beat together all the ingredients until smooth. Divide loosely into eight and spoon these on top of the brownie batter in the pan. 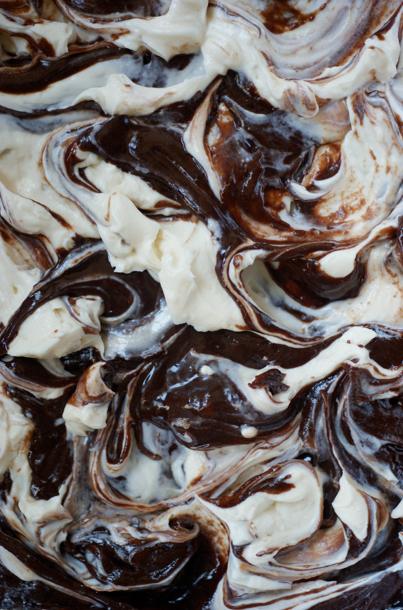 Use a blunt knife to swirl in. Put into the oven for about 30-5 minutes, until just set in the middle of the pan. Leave to cool, then cut into small squares and enjoy. Love cheesecake brownies! They are so what you need to help studying. I hope everything is going well. I remember studying for my 3rd yr exams and it was gorgeous outsidebut I couldn't enjoy it. Don't worry, it'll all be over soon and then you can sunbathe to your hearts content! Anyway, thanks for sharing this. Great pictures you have here! Hope the essay writing isn't too taxing so you can enjoy the sunshine. mmm cheesecake + brownie = heaven!! bet these are so good!! Having made hundreds of brownie recipes, I can vouch that this one is an excellent one and I will be making it very soon! 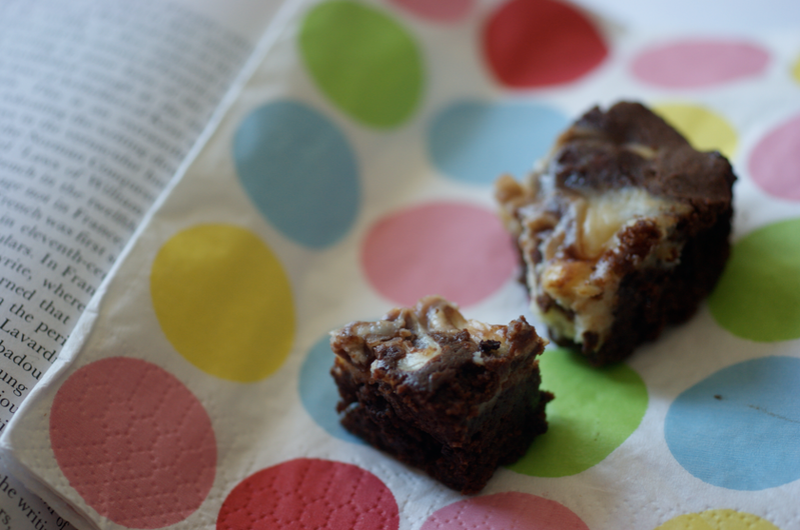 I adore Cheesecake Brownies, and, of course, I adore David Lebovitz! These looks fantastic. I shall have to try them soon, especially since I just got a replacement for my kitchen scale! Do you think these are best served cold, warm or at room temperature? Do they improve in the fridge? I'm afraid I can't remember how these particular brownies are cold/warm etc (as I haven't eaten them for three years!) but generally I find brownies improve after being frozen and are best served cold or room temperature (but I know a lot of people like them warm as dessert).